In the starting phase, HTExplore’s services will focus mainly on applications of its Polyolefin Catalysis HTE Workflow. The offer is structured so as to allow for three different entry levels (Figure 1). Customers who are not familiar with HTE can start at a very basic level, with simple demonstrations of platforms and technologies on prototypical catalysts and processes. At an intermediate level are validation or benchmarking projects consisting of the application of the full Workflow to one or more catalysts or processes indicated/provided by the customer. The advanced level consists of the application of the Workflow for screening campaigns on one or more customer’s development catalysts or processes, aimed at fine-tuning or optimization in view of commercial application. Hands-on training of customer’s personnel can be included in the study at intermediate or advanced levels, or requested as an independent service. Figure 1. 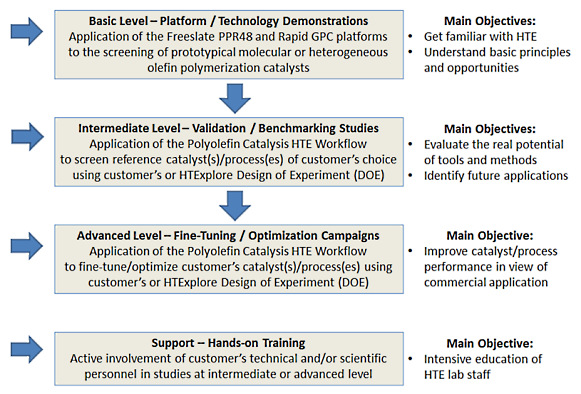 The multiple-entry scheme for the Polyolefin Catalysis HTE services of HTExplore. - (Basic): What can I do with this technology? - (Intermediate): How well does it work in cases of my interest? - (Advanced): Can I use it to improve my catalyst(s) and/or process(es)? The Hands-on Training service, in turn, can be of use in view of HTE platform implementations at the customer, or to make the customer better able to dialogue with HTExplore experts in collaborative projects. State-of-the-art HTE platforms are powerful but expensive. In the following paragraphs we will try to illustrate the balance between these two properties for the Polyolefin Catalysis HTE Workflow of HTExplore, so as to let potential customers develop an unbiased opinion on whether or not the approach is convenient. The base unit for all services in Figure 1 is a Freeslate PPR48 library of 48 polymerization experiments. A PPR48 consists of 6 reaction modules, each containing 8 mini-reactors (cells). Each cell is fully monitored on line with respect to temperature, pressure, monomer uptake and uptake rate, and programmed for an individual set of conditions which can be different from all others. The only constraint is that temperature and total pressure must be the same for a given module; therefore, in each library one can explore 6 different values of the said two variables. Of course, the Design of Experiment (DOE) is decided in advance; importantly, however, the Freeslate software allows one to change the DOE at any time throughout library execution; this means that the operator can correct or modify the initial settings for whatever reason. In typical cases, the time needed to initialize the platform, prepare the catalyst system solutions/slurries, execute the library, recover the polymers and restore the platform for the next library is 6-8 hours; it could be shorter, considering that the PPR cells have disposable glass inserts and PEEK stirring paddles (which represents a tremendous simplification in the post-reaction phase), but at HTExplore we do not run our PPR48 at maximum speed, because we like to evaluate the start of each experiment before launching the next one. This operation mode takes some more time, but dramatically enhances the effectiveness of the screening, and ultimately minimizes the number of libraries that are needed to hit the target. The library output consists of a detailed description of the DOE, and a collection of (x,y) plots for all monitored reaction variables (i.e. temperature, pressure, monomer uptake and uptake rate) as a function of time. In addition to the standard Freeslate software output, the raw (x,y) data can be provided as MS Excel spreadsheets for independent customer elaboration. As noted above, in principle one library provides information on 48 different polymerization experiments. On the other hand, the HTExplore way is to run the experiments in duplicate/triplicate, and include a limited number of reference cells in the library; based on experience, this strongly enhances the significance of the results, and delivers productivity data with a meaningful error bar. Correspondingly, the number of different polymers that can be obtained per library is 15-20; the yields of duplicate/triplicate cells can be summed up, which is beneficial in view of polymer analysis downstream. The cost per library to the customer depends on which polymer characterizations are requested in addition to the polymerization data. Indicatively, a PPR48 library without any polymer characterization has a cost of 6.5 K€; this rises to 10 K€ with full GPC polymer characterizations by means of the Freeslate Rapid GPC platform (which is integrated with the PPR48), and to 15-20 K€ if full 13C NMR, DSC and fractionation analyses are requested. In all cases, the costs are all-inclusive (apart from VAT when that applies). Customers from academia are entitled to a 10-20% discount (depending on the amount and complexity of the requests). As a rule of thumb, 1-2 libraries can be enough for a demonstration (basic level); 3-5 libraries are needed for a significant benchmarking study (intermediate level); 5-10 libraries or more configure a serious fine-tuning or optimization screening. In the latter two cases, typically 1-2 preliminary libraries are necessary to optimize the DOE, based on how the investigated catalyst(s) performs in the PPR48; these libraries are usually run at no cost for the customer. With the above we tried to be fully transparent. For any additional information, do not hesitate to contact us (see ‘Contact’ page).